A "fake" end-user is required in order to add satisfaction ratings back to your Zendesk account. You can learn more about how that integration works here. 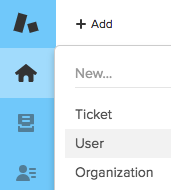 Login to your Zendesk account, hover over the + Add link in the top left corner, then click User. Enter a name, email address and make sure End-user is selected for the role. For name you can enter something easily identifiable, such as Simplesat Integration. Make sure you use an email address that you have access to, as you'll be required to click a confirmation link later. If you use Gmail (or G Suite) and already have your email used in Zendesk, you can add a "+" and then any text after for Zendesk to treat that as a new address. For example, if your email was [email protected] you could use [email protected]. You should receive an email to reset your password. Make sure you do so in incognito mode or while you're logged out of your main agent Zendesk account. After you set the new end-user's password, log out and back to your agent account again. In order to authenticate you'll need to enter the end-user ID, email and password. You should have the email and password from the steps above.